Data storage solutions for small to medium sized business in and around Orlando Florida. Not very long ago there was a crystal clear distinction between the data storage needs of small businesses and larger companies. Small businesses depended mostly on storage contained in PCs scattered around the office, with maybe a small Windows PC or server used to share files and print services. Most small businesses lack having a network administrator or anyone with the expertise necessary to configure a server correctly or maintain even a small network. If files are unavailable for a few hours or even a day, it is an inconvenience, not a disaster. Most large enterprises have complex networking infrastructures, with stringent security and performance requirements maintained by professional network administrators and computer experts. How to Meet Growing Storage Requirements – The storage needs of small businesses have dramatically grown thanks to the digitization of formerly paper documents; increased use of voice, video, and other rich media; the Internet; and regulations requiring years of data and file retention. Many businesses have seen their storage requirements double and triple year after year. They need efficient ways to store and share much larger volumes of data without busting their budget or hiring an IT department. How to Protect Your Mission Critical Data – As with larger companies, many small businesses rely on being able to access data quickly and efficiently and can barely function without data access even for a few hours. Small businesses need to find a low cost way to backup and protect their data. How to Reduce or Eliminate Computer Downtime – Small businesses increasingly partner with larger enterprises in a global environment, or work with customers across time zones. They need simple, low cost, efficient ways to keep their data accessible on a 24 by 7 basis without sacrificing backup and server maintenance. How to Fulfill Stringent Audit and Regulatory Requirements – It’s not just large businesses that are affected by audits and federal regulations such as HIPAA and the Sarbanes Oxley Act. Many of the smaller businesses such as lawyers and doctors need simple, workable strategies for storing and protecting sensitive data with a level of effectiveness and sophistication equivalent to that of their enterprise counterparts. How to use storage effectively in a Virtual Server Environment – As we take advantage of the Web and server based applications such as email, shared calendars, and CRM – customer relationship management, not many small businesses have migrated to server virtualization yet due the cost associated with paying a professional to design, build, configure, deploy, migrate data and other highly technical tasks required to get the job done right. The long term benefits of a virtualized server environment in a small to medium size organization are savings in electricity and physical footprint space. 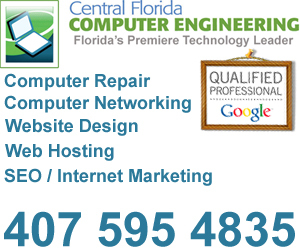 While these issues can seem daunting to small organizations with a limited IT budget, the good news is that Central Florida Computer Engineering has extensive experience designing, deploying and supporting the IT and data storage needs of small and medium sized businesses all over Central Florida.